Last year, I caught the Telegraph red-handed in a politically-driven smear campaign on the NHS, as it slipped up and left instructions to its sub-editors not to remove a damaging paragraph from a front-page article where it had no relevance. The ‘newspaper’ is also on record as co-ordinating its stories with private health companies to sway public opinion. The paper is so closely linked to the Tory political agenda that it marches in lockstep with the Conservative party. It distorts information shamelessly and functions as a barometer of what the Tories are up to, if you know what to look for. Note the sections underlined in red. The Tories are busy making swingeing changes to disability benefits that are putting hundreds of thousands of people into poverty, and have been stooping to any depths of deceit in order to justify this ‘liberation’ of people from a half-decent standard of living. Reading the Telegraph’s headline, you would naturally think that it was to do with changes implemented under the Tories and showed how many ‘scroungers’ had been driven off benefits by the threat of proper scrutiny. And if you’re a typical Telegraph reader, you’ll likely think ‘Great, sort those scroungers out! More of the same, please!’ And if you hear stories of hardship and despair, you’ll think them exaggerated ‘sob stories’. And word spreads – the poison leaks out into the wider consciousness, which is exactly what it’s intended to do. But – as usual – all is not what it’s made to seem. Because I’m always suspicious of how this government used statistics, especially when it’s via the Telegraph, I went looking for these ‘latest government figures’. And I found them. We’re cutting people off from support and making them jump through hoops to get benefit – and already we’ve exposed almost a million of them who must have been pretending, because they didn’t want to go through the test! We must continue the process and drive out the many scroungers who must remain! Welfare makes up a third of this country’s spending – so it’s our job to make sure it’s getting to the people who really need it. Our reforms are about freeing people from a system of dependency that’s trapped them and their families for decades – and people are getting back into work as a result. These figures demonstrate how the welfare system was broken under Labour and why our reforms are so important. In 2009, the Labour government was already taking steps to focus benefits on those most in need of it. As a result of those changes, almost 900,000 opted not to go through the assessment process to remain on disability benefits. Many of the 900,000 might have been genuine but were intimidated by the prospect – but those who are still on DLA, ESA etc are those who did choose to go through the tests, because their need was genuine and they couldn’t get by without that support. Yet the present government is targeting them, demonising them and pushing hundreds of thousands into poverty anyway. As I showed in a recent post on the NHS, context is everything. The Tories and their press allies are past masters at stripping away the context so they can use the resulting distortions to attack their victims with impunity or even the approval of an ignorant public. And entirely typical of the odious bunch of worms and snakes who are pretending to run the country while lining the pockets of their friends and backers. It took me five yrs to be accepted for DLA, I couldn’t have got it had it not been for a disability association pushing me and helping me with the final claim. During the five yrs I was trying to claim I was subjected to numerous physical examinations which were degrading to say the least. I was more or less accused of being a malingerer, I had cervical and lumber spondyslosis and Fibromyalgia and only left my bed to travel the long painful journeys for those examinations. I was given it for an indefinate period, life, Two yrs later the Back to Work examinations for the disabled came into force………not wanting to undergo any more degradation I did decide to put an end to my own payments because the stress of having them was adding more illness to an ever increasing list of ailments. I did not lose, after I wrote a blunt and to the point letter to Alistair Darling I was allowed to forgo the examination and kept my DLA……….here I am again waiting for the chop which I am informed will come in 2015 by which time I will be 67…..disabled people have enough to cope with every day without being made to feel they are a burden on society……in 2015 I will be relinquishing my DLA I will not subject myself to further degradation. Hi Jan, I think I am right in saying that when PIP comes into force it will only be people of working age who will be reassessed, the 16 to 64 year olds, as you will be 67 years old you should be left alone, for the time being anyway….. Thanks mate – should be an interesting show! 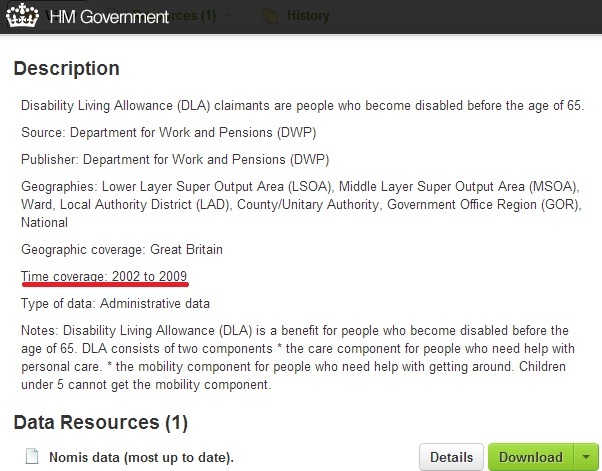 The previous government had plans to take over DLA so I wasn’t a bit surprised the Tories took it and ran with it. Ironically friends with disabled children had great hopes that Cameron having a disabled child himself would be more compassionate than Blair………WRONG!! So it is Labour who is responsible for kicking these 900k poor souls off benefits? Well, that all depends who they were and why they didn’t go forward. Large part might have been on the benefit short-term only. Some might have been taking advantage. No data giving details that I’m aware of. Well, which is worse, taking credit for this inhumane act or actually perpetrating it? It’s not proven as inhumane yet. i will not be giving up DLA…It took a very long time to get it ,two years in fact, numerous medicals…I was perfectly ok and a hard working person until i got struck down with meningitis..I have various long term damage from that,,I have Anklosising spondylitis.spondylosis. Asthma. multiple osteoarthis..two hearts defects.,diviculitis..post traumatic stress disorder from being attacked in the street[ and not being able to defend myself due to my disabilities..,and of course depression…Am i fit for work am i f—…They have a fight on their murdering hands with me…..Anyone genuine like me ,try not to let them bully you…you did not ask to have ill health.. I think the figure of 878,300 comes partly from data gathered between October 2008 and November 2011 (not 2002 – 2009) with the latest figures added to the 739,350 total. 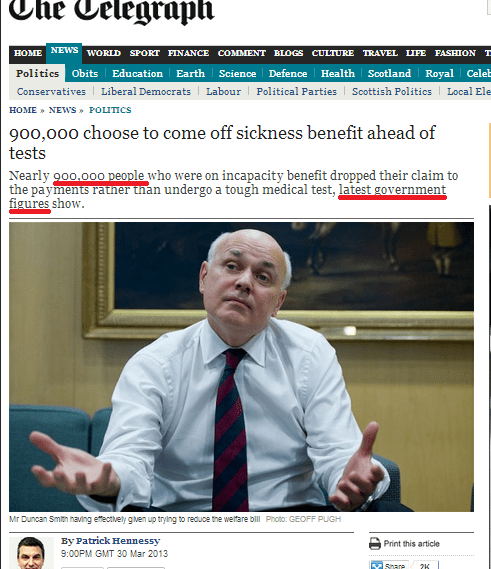 The Telegraph and a few other articles give the impression that this is a relatively recent flood of claimants dropping their claims for Incapacity Benefit when the document only states “Claim closed before assessment complete” which is not exactly the same as “choose to come off sickness benefit ahead of tests” which gives the impression the claimant’s aren’t genuine. Good article, Of course the claim may have been dropped because the claimant died, or even got better as well as the obvious intimidation. You’re missing the point. See the post I’m about to write now.. The former being used as an excuse to justify the draconian extent of the latter..
Well, if your numbers are correct (2009) then the true blame for this debacle should fall squarely on the shoulders of Labour and their apologists. They were in office in 2009, last I checked. You’re still missing the point. Entirely. Shapps is trying to blame his actions on Labour’s ‘mess’ (what a surprise) and take credit for 900,000 ‘skivers’ withdrawing from the benefit, when what the stats show is Labour getting on top of the issue. Typical.. Yes, faffing about in regards to the political game does nothing in regards to helping those at the bottom who actually have to bear the brunt of these massive cuts in benefits. Which is more important, political posturing or fixing this mess? Hard to disentangle the two! Helping those at the bottom depends on getting rid of this government, in 2015 or sooner if possible. Appreciating the time and effort you put into your blog and detailed information you present. It’s awesome to come across a blog every once in a while that isn’t the same unwanted rehashed material. Wonderful read! I’ve bookmarked your site and I’m including your RSS feeds to my Google account. The figures you found are to do with Disablity Living Allowance (DLA), the Torygraph story referred specifically to Incapacity Benefit (IB). These are two very different benefits. DLA can be awarded whether the claimant is in or out of work and there is currently no Work Capabilty Assessment for DLA. This kind of inaccuracy doesn’t help the cause. No, please re-read what I wrote more carefully. That link is an example of the dating of government stats, but the post is about IB/ESA. You might also want to read the follow-up post I did, which goes into the ESA stats in detail.